I have a strong affection for fall, but I wouldn't call it love. In autumn I'm usually too busy mourning the end of summer to fully enjoy the new season. But we've had some gorgeous fall weather here, so I decided to snap out of it and try to cherish all the beautiful things about fall before they're gone. I extended my new attitude toward autumn to the kids in our little co-op preschool, so here are a couple of fun autumn ideas to use in preschool or with little ones at home. 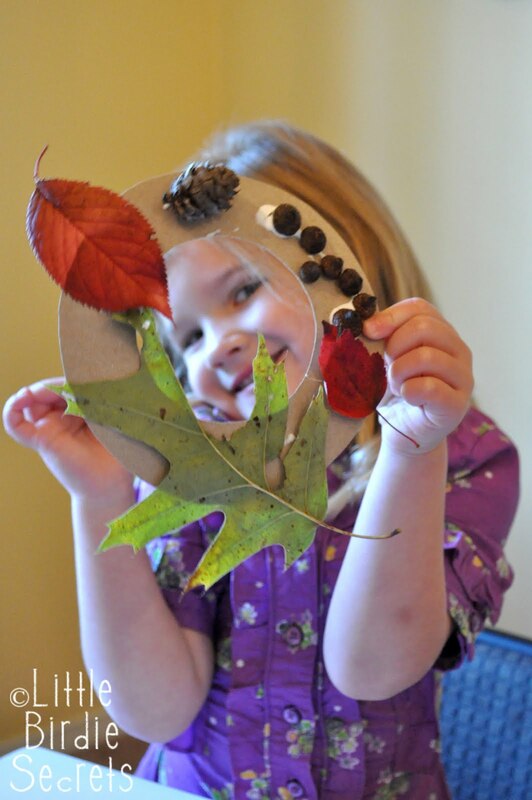 Help kids make a beautiful fall wreath using items found during a stroll outside. I was worried about taking 5 preschoolers on a fall walk all by myself, so I did a little prep work with my own kids the day before. 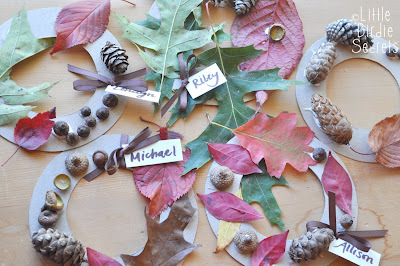 We went on a fall walk and gathered leaves, acorns, and pinecones. Then I cut 5.5" wreaths out of thin chipboard (like the stuff that comes in a pack of scrapbooking paper to keep it from getting bent--I always save it). I spread out all the findings in the middle of the table and let the kids pick what they each wanted on their wreath. Then it was gluing time! I let them use Tacky Glue to glue their pieces on. Then, while they were busy at free time, I added a little hot glue to the heavier items, just to make sure they stayed put. It was so fun to see what they made! For snack time I cut thin slices of apple (about 1/4" thick). 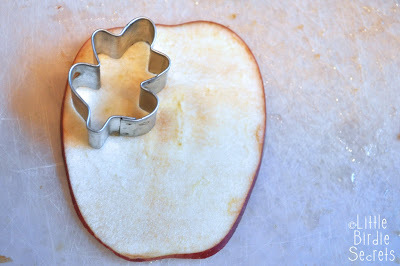 Then I broke out my Wilton Harvest Collection mini cookie cutters and let the kids cut shapes out of their apple slices. 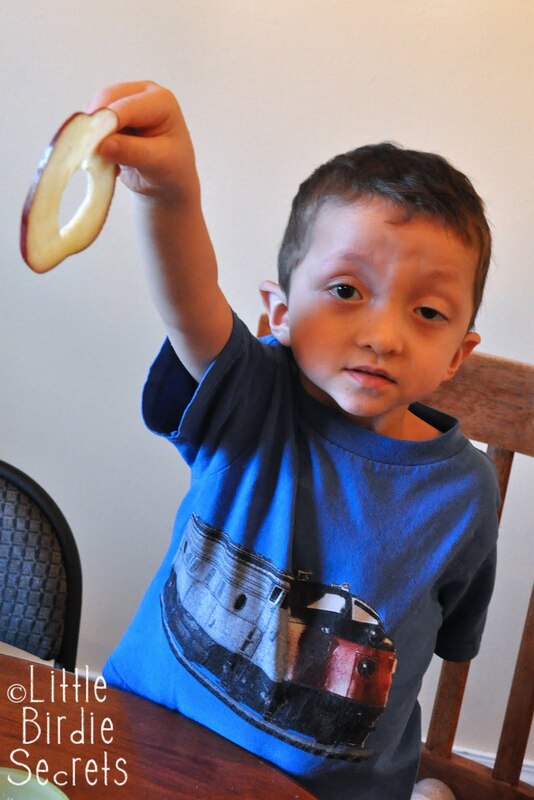 I was amazed to hear several times, "Can I have more apples?" They couldn't get enough of cutting out the shapes and eating them! This would work for any season--just change the mini cookie cutters. I found mine on sale at Michael's for $1. Oh, lovely fall, I think we could be friends after all! Still love ya though, Mandy! tee-hee. I had my grandchildren doing the same thing but on a wooden boxes that my husband brought home last summer , I asked the kids to go out and find anything that would look good on the box, leaves, limbs(tiny) with moss, acorns,odd shape twigs, even small rocks, they had a ball doing this ;I love the apple cut out idea ,my grandchidren would love this too.A Fall weath would be great also. 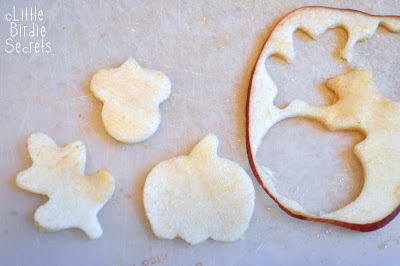 these wreaths are SUCH a cute idea! We might do these tomorrow. My little ones spent an hour collecting nuts today! Two great ideas! I love to take the kids treasure hunting in the yard to see what we can find to use for crafting. If you'd like to link your post up to my Theme Party Thursday, I'm going to leave the link open all week this time. Have a great day! So cute. I took my girls out and all they wanted to collect was bugs. Maybe tomorrow. I really love that idea for making a wreath! Thanks for sharing! Cute idea! This would be great for our play group. 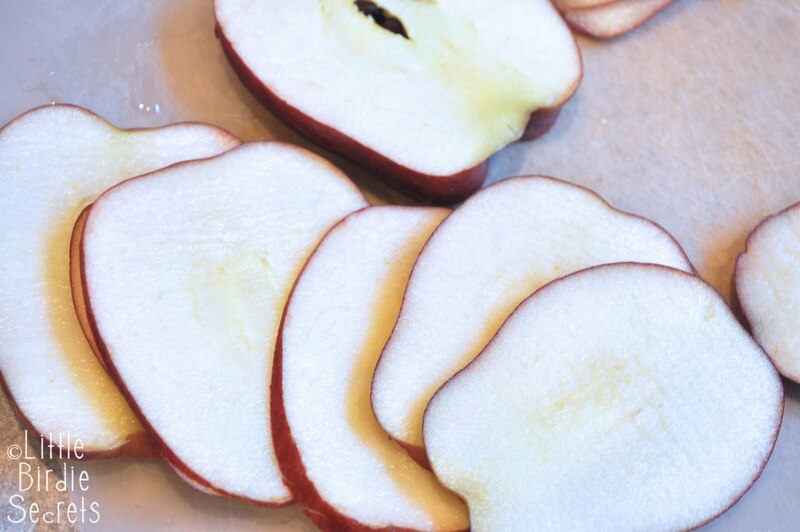 Love the cut outs using the apples. 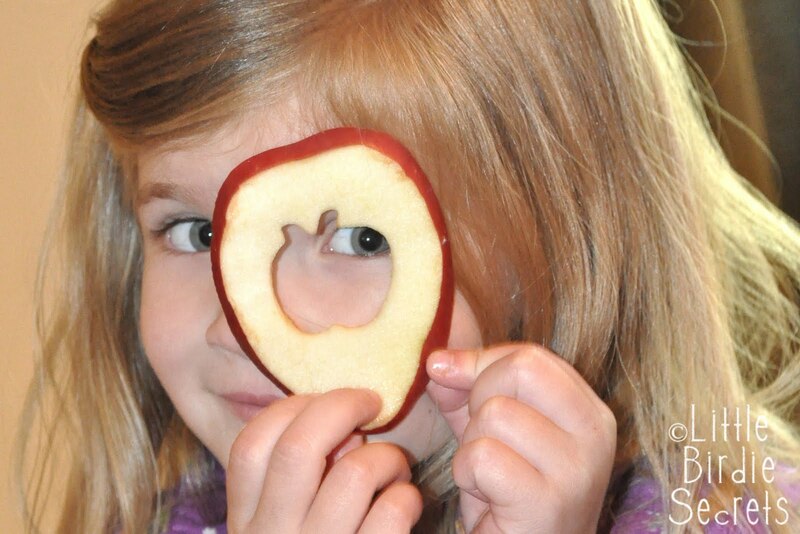 Such a cute craft! Cute kids too! :) Londyn couldn't stop talking about the apples! I will have to do that for her again! I like this idea. I bet you could even put cinnamon on them and bake them?? Or pumpkin Pie spice? HI! I love the apple cut outs idea!! I linked to this on our Three Sisterz FB page. This was fun! 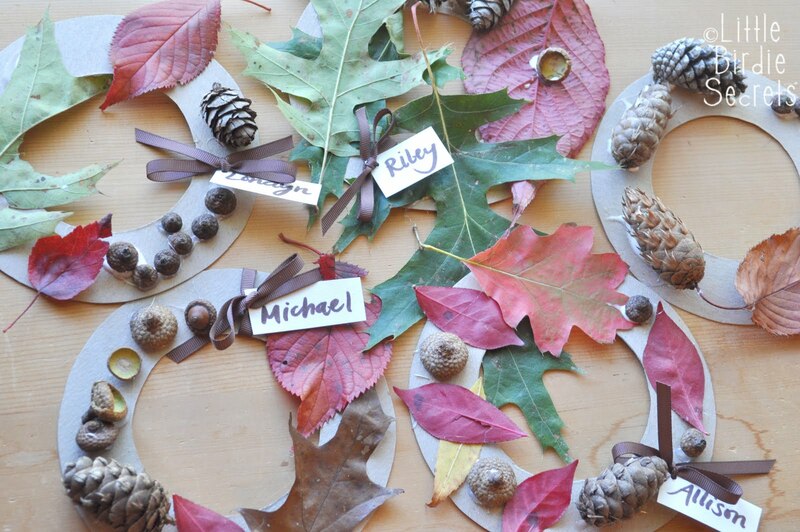 I tried the wreaths this morning with two 2.5-year-old boys. They enjoyed walking around the back yard, but I was the primary "collector." 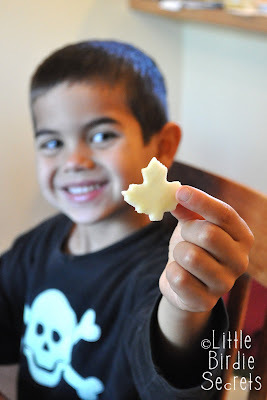 When we came back inside, one boy picked out some items and told me where to glue them. After we glued everything, I showed him what it looks like hanging on the door. I think he gets it. The other boy wanted to play with the "empty wreath" (the cardboard I had cut out) and did NOT want anything put on it. At least he liked playing with the cardboard -- it was a hat, a mask, a bracelet, etc.